The National Basketball Association has announced an improved Official Game Ball that will debut in the 2006-07 NBA basketball season, the first time the official ball has been changed in 35 years and only the second time in 60 seasons. Instead of the traditional eight panels of leather sewn together, now it's constructed of two interlocking cross-shaped panels of microfiber composite material, which doesn't need the break-in period needed by currently-used leather balls. Spalding says its "Cross Traxxion" technology makes the ball easier to grip, more consistent from ball to ball than the old leather style, and also better able to resist moisture buildup. 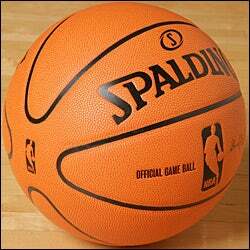 The $100 high-tech ball will be available online at the beginning of the NBA basketball season in October. A basketball for $100? Mkay.